I face a plethora of distractions behind the wheel; it’s a wonder I make it home in one piece! For the most part, my cell phone is to blame, but my preschooler certainly does his best to contribute to the mayhem. With smartphones, multitasking has never been easier, which is great for productivity, but not so great for road safety. I’m not proud to admit I’ve had to brake suddenly while responding to emails from my cell phone. Two things have saved my hide on more than one occasion: luck and good tires. It’s time I got smarter about my smartphone and took the dangers of distracted driving seriously. 1. Put your phone in your glove box, trunk, or backseat—think hard to reach. 2. Give your phone to the kids to play with, so you can’t. 3. Remember you’re setting the example, so set a good one and follow THE LAW. 4. Ask your kids to hold you accountable. If they see you reach for your phone, ask them to call you out on it. 5. I imagine slamming into a cyclist. Is it morbid? Yep. More importantly, it’s sobering and it works. I drop my phone like a hot potato every time. 1. Resist the urge to text from behind the wheel with the AT&T DriveMode app. When enabled and your vehicle is traveling 25 mph or more, the app automatically sends a customizable auto-reply message to incoming texts, letting your contacts know you’re driving and will respond when it’s safe. Available for Blackberry users too. 2. Stay alert while driving with Verizon Safely Go. Safely Go permits calls and texts from only 3 contacts (like your spouse or boss) and lets everyone else know you’re driving through an automatic text reply. This app also only allows you access to your 3 favorite driving apps (like maps, navigation, or music). 3. Just like the Verizon version, Safely Go by Sprint automatically replies to texts, sends your calls to voicemail, and limits your incoming and outgoing activity to your top 3 people and apps. 1. Check your tire pressure and rotate your tires every time you change your oil or approximately every 5,000 miles. 2. Check your tire pressure before every road trip. Do it yourself or have it done by a professional. Many tire shops will adjust your tire pressure, inspect your tires for unusual wear patterns, and repair flats free of charge if you purchased your tires through them. TIP: Know your PSI. Follow the guidelines found in your vehicle’s owner manual or look at the sticker attached to the vehicle’s door edge to view the correct air pressure for your tires. 3. Vehicles equipped with Tire Pressure Monitoring Systems (TPMS) are not a replacement for regularly scheduled pressure checks. Federal regulations call for TPMS to alert drivers when tires are 25% under inflated. For many vehicles, this forewarning may be too late to avoid damage caused by improper inflation. 4. Examine your tire tread. Well maintained tires are better equipped to handle sudden swerves and stops. 5. If you anticipate needing tires and have flexibility around the purchase, check for upcoming rebates. March and April are good months for tire rebates. 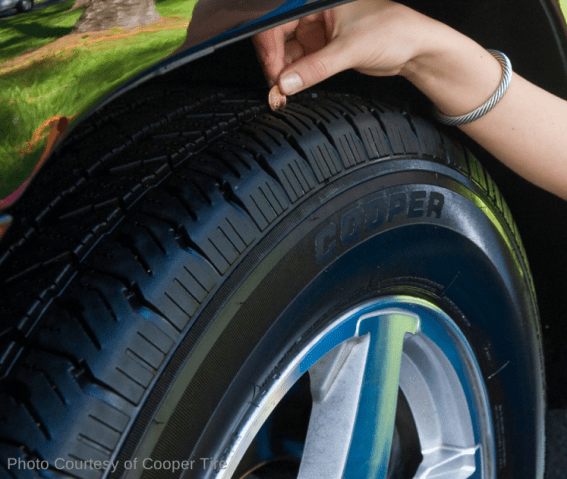 Cooper Tire is rolling out a rebate this June. 6. Properly inflated tires last longer and get better fuel efficiency. 7. Don’t forget to check your spare. 8. Cold air compresses. Under inflated tires can become even more so in cold weather. 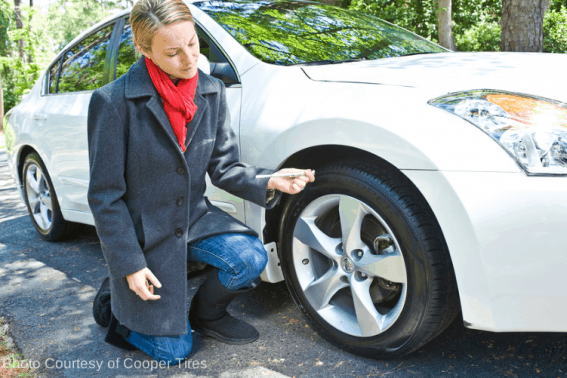 It’s especially important to check tire pressure before road trips to cold climates. 9. If you’ve only purchased two new tires, make sure they’re placed on the back on the vehicle. Celebrating 100 years of crafting tires for life’s road trips, Cooper Tire recently announced its newest product, the innovative CS5 Touring tire. This premium tire delivers remarkable all-season performance targeted for drivers of modern sedans and SUVs. It includes an innovative new Wear Square™, which is a visual tread wear indicator that gives consumers a convenient way to gauge the amount of wear on the tread of the tire, signaling when it is time to replace the tire. For more information on the CS5 Touring, visit www.coopercs5.com.